The age-old question…How do you choose the engagement ring? There are endless factors to consider when selecting the perfect ring for your loved one. Here are some key things to think about when making your decision. Gold is the most common type of metal used for rings and there are a few different variations to choose from. Yellow gold is the most popular variation of metal and is made up of pure gold along with a little bit of silver and copper. Or, select the increasingly popular rose gold, which is made up of gold and copper – the copper added gives the metal red colour. When thinking about using gold for your engagement ring, you might get asked about the carat. We know, unless you’re a gold expert, how are you to know what a carat means? Gold comes in five different carat purities, the higher the number of carats means that there is a higher percentage of pure gold. 9 carat gold is the lowest that you can buy in the UK, 37.5% pure gold. The highest possible to buy is 24 carat gold which is 99.9% pure gold and too soft for normal jewellery. 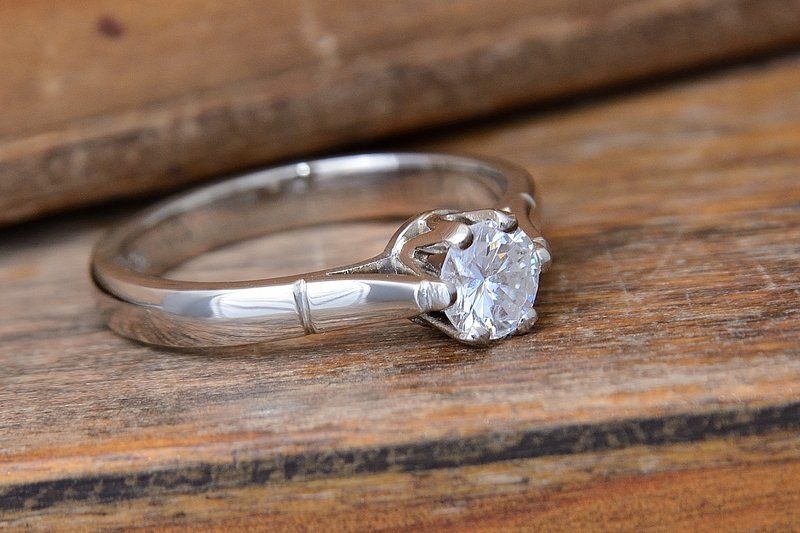 However, the higher the carat the better the finish and usually the softer the metal. Platinum is a white metal and is the most expensive type of metal because it is much harder to work with and polish. Engagement rings made of platinum would be 90% to 95% pure and doesn’t tarnish or oxidise. It also feels a lot heavier as it is a dense metal, platinum is typically 40% heavier than 14 carat gold. Platinum is the most fashionable metal type used for wedding and engagement rings at this time. it will wear over the years, but you can have it polished back up. Silver is a much softer metal which means that it is a lot more susceptible to scratching. 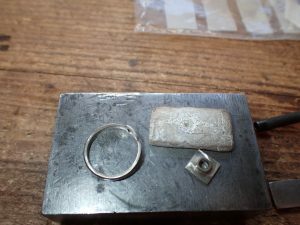 Silver rings cannot be made from pure silver due to this and therefore mixed with other metals such as copper which helps to boost its durability. Silver does have a tendency to discolour due to oxidisation making it start to go black, this. Silver is a lot cheaper making it a more affordable metal. There is so much choice when it comes to choosing the stone. We’ve listed just a few of them below. Thinking of the colour she’d like you can pick the stone for the engagement ring according to this. If she likes red, why not choose a Ruby or Garnet? Or maybe, if she likes green, she’d love a Peridot or Emerald stone! 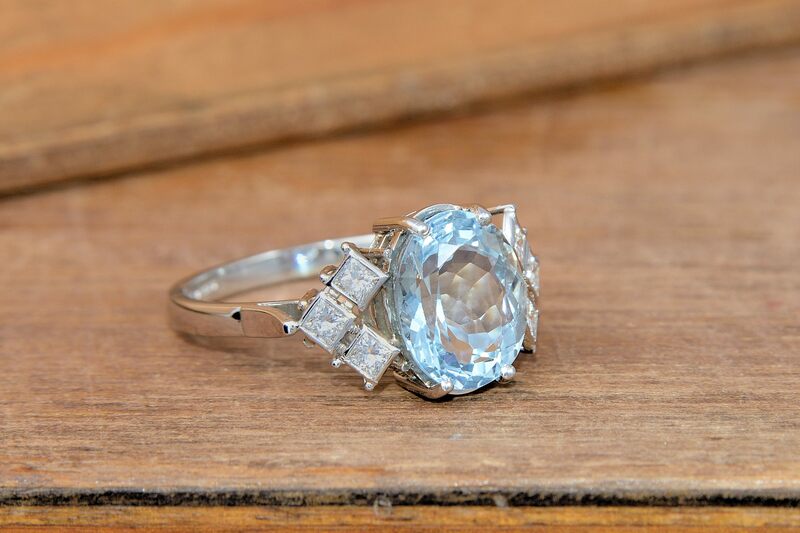 If she’s a classic girl, choose the classic Diamond. When it comes to picking the right stone, you also need to think about the shape. There are a number to choose from, you could have a cushion shape, a heart, or even a princess shape. The guide below shows you all the variations you can choose from to help you create the perfect engagement ring. Selecting or designing the ring is then the fun bit! What style of ring will you choose? There are many different cuts and designs to choose from, including a simple design with one stone, a cluster; or, maybe a vintage ring? Here at The Goldsmithy you can create your own bespoke engagement ring! The style you want, one of a kind and we’ll work to your budget! 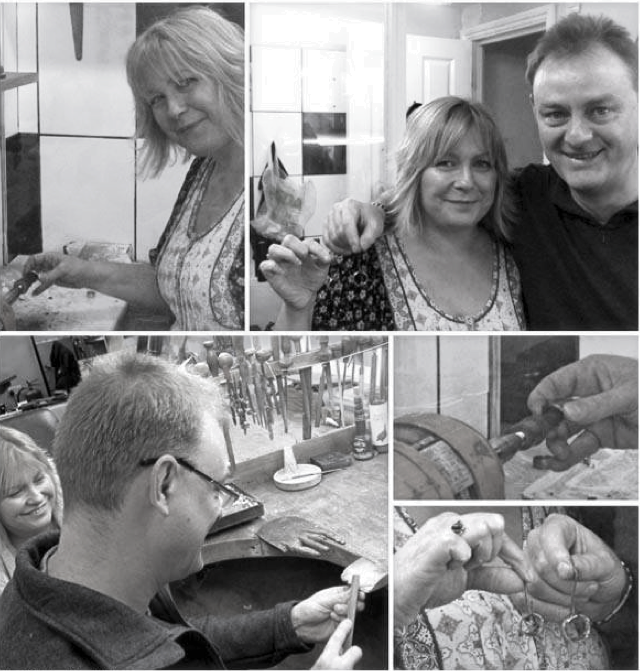 We offer a unique experience as you can be a part of the making of the ring too – making it even more of a special moment. 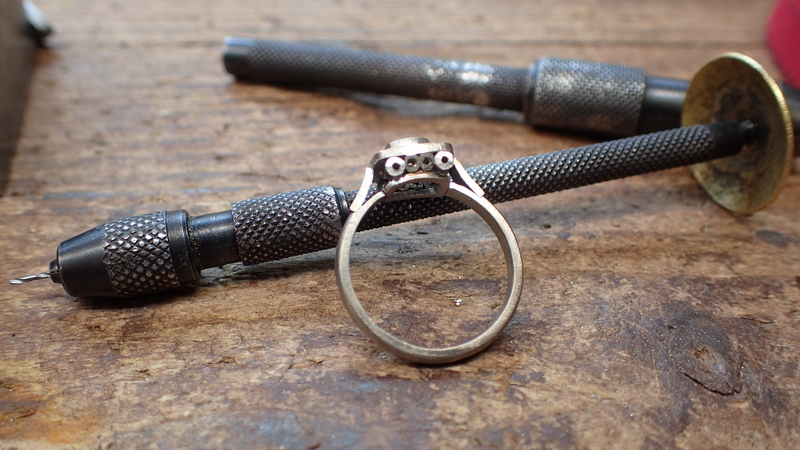 Find out more about creating your own bespoke engagement ring at The Goldsmithy. When creating your own bespoke engagement ring there is a 6-month lead time. 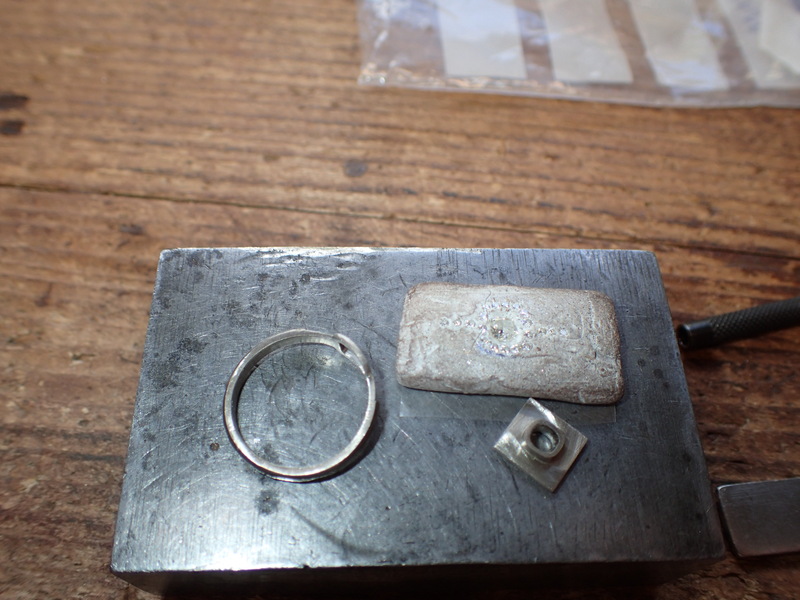 This is from design to the finished ring. The first is the designing of the ring. 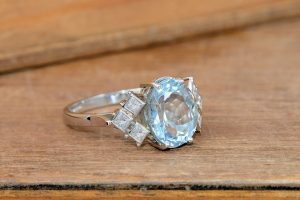 This is a free consultation which enables us to get to know what you want the ring to be made of, what shape and style and what stone you want. The second stage is the making of the ring, this is where you will get to have a go at our trade and put a special stamp on the ring as well. 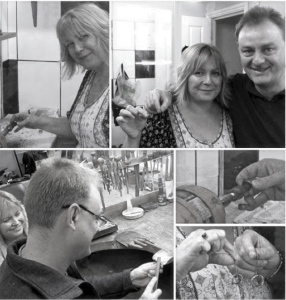 The third stage is when you get to see your ring being made which enables you to make any changes before the final touches are done ready for the big moment! 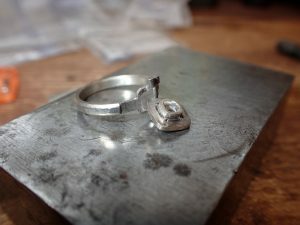 The best part of making your own ring? She gets the ring of her dreams and you get to make your own mark on the ring. Here at The Goldsmithy we believe that the engagement ring is a personal symbol of love to your loved one and is individual to everyone which is why we will expertly melt, file and set together your choice of metals and stones ready for the big moment! Contact us to have a consultation about your ideas.